RACINE – Phyllis (nee: Quandt) Orth, age 71, passed away peacefully, surrounded with the love of her family, on Saturday, February 9, 2019 at Hospice Alliance – Hospice House in Pleasant Prairie. Phyllis was born in Milwaukee on March 13, 1947 to the late Edward and Lydia (nee: Junghans) Quandt. A 1965 graduate of Wisconsin Lutheran High School, she went on to graduate from Gateway Technical College with a Licensed Practical Nursing degree. On August 21, 1981 she was united in marriage with Joseph George Orth. With a profound Christian faith and devoted to studying her Bible, Phyllis attended Racine Bible Church. 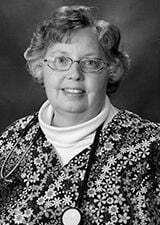 She served our community as a compassionate & caring LPN with St. Mary’s/ All Saints / Ascension Medical Center for over 35 years, having been awarded the “Caring Heart” by her peers before retiring in 2014. Among her interests, she enjoyed reading, sewing, crafts and cooking. Above all, Phyllis was all about her entire family. They were her world! Surviving are her loving husband, Joseph Orth; children, Dean Berget, Dawn (Robert Horn) Walling, Daniel (Sarah Wilson) Berget, Nathan (Tabitha) Orth, Joseph (Michelle) Orth and Lisa (John) Kalwitz; grandchildren, Joseph & William; Rebecca, Hannah, Violet, Aaron & Jamie; Elyssia & Marisa; Oliver & Lydia; Holly, Brandon, Ethan & Kristin; Desiree, Jordan & Jayme; great-grandchildren, Andrew, Mason, Brevyn, Daxtyn, Ava, Christopher, Kahna, Pharlie, Chasen, Elway, Kylee & Sonia; sisters, Marian Schroeder, Lois Rehm, (twin sister) Alyce (James Hulton) Bergbower; sister-in-law, Bridget Quandt; nieces, nephews, other relatives and friends. In addition to her parents, Phyllis was preceded in death by her granddaughter, Heather; brother, Harvey Quandt; brothers-in-law, Harlow Schroeder and Rev. Merlin Rehm. Funeral Services celebrating Phyllis’s life will be on Friday, February 15, 2019 at 11:00 am in Racine Bible Church, 12505 Spring Street, with Rev. Darien Bowers officiating. Entombment will be at West Lawn Memorial Park. A luncheon will follow. Visitation will be in the church on Friday from 9:30–11:00 am. In memory of Phyllis, memorials to Samaritan’s Purse (providing Christian international relief to those in need) have been suggested. Special note of thanks to Dr. Ryan Engel, Dr. Shayan Rayani, Hospice Alliance & Ascension All Saints Hospital for the comforting care & support given in Phyllis’s time of need. May God bless all of you!